Nuts are one of my favorite snacks especially when mixed with dried plums, apricots, raisins or cherries. I normally eat them raw or toast them lightly to mix into salads. I don't like to buy the salted and roasted nuts, because they are way too salty. I had a big bag of raw cashews and I decided to liven them up with curry and sea salt. Turmeric is a spice that is found in curry powder. It gives mustard and curry its vibrant yellow color. And it's curcumin—a compound in turmeric—which causes that yellow color. Curcumin is an antioxidant and anti-inflammatory rockstar. It protects against cancer. My grandmother told me once that I should eat a spoonful of mustard everyday, because it was good for me. I think I now know why she told me that. Preheat oven to 350. Put cashews into a bowl. Mix oil, curry and salt into a smaller dish. 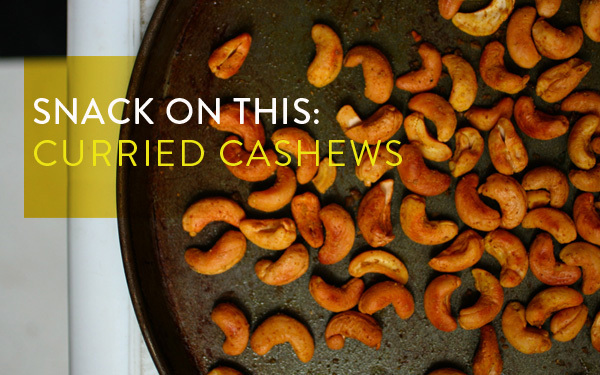 Pour over cashews and mix very well with your hands. Spread into one layer on a baking sheet. Bake for 10 minutes, and move the nuts around on the pan, so they cook evenly. Bake for another 5 minutes, checking to see if the nuts are browning. Cook until they're the color you prefer. Let cool completely before enjoying or storing in a glass container. Enjoy!